Dr. Ryota Nakajima, Postdoctoral Researcher, Department of Marine Biodiversity Research at the Japan Agency for Marine-Earth Science and Technology (JAMSTEC: Asahiko Taira, President) and his team monitored the benthic ecosystem of hydrothermally active areas in the Okinawa Trough at 1,060m depth, where scientific drilling was performed by the Deep Sea Scientific Drilling Vessel Chikyu on September 2010. The monitoring started before the drilling operation and lasted 40 months thereafter. 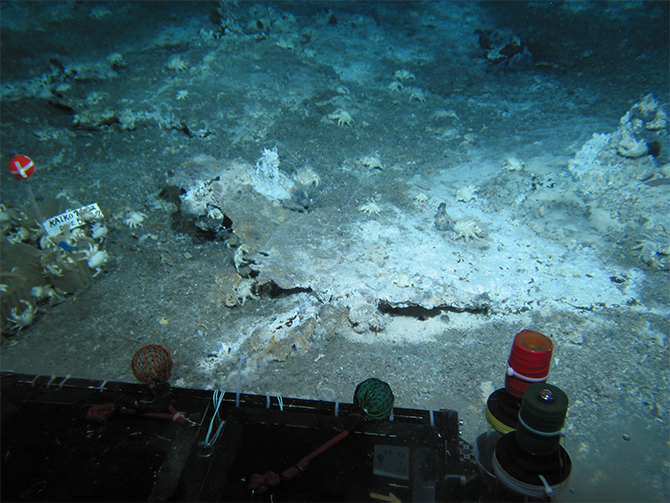 As a result, it elucidated impacts of habitat alteration on hydrothermal vent communities and the primary processes concerning the formation of deep-sea hydrothermal-vent ecosystems. Changes in hydrothermal vent communities depend on variations of physical and chemical properties in hydrothermal fluid flow. However, case studies that recorded these processes had been previously limited to observational data of faunal assemblages resulting from seafloor volcanic activities. 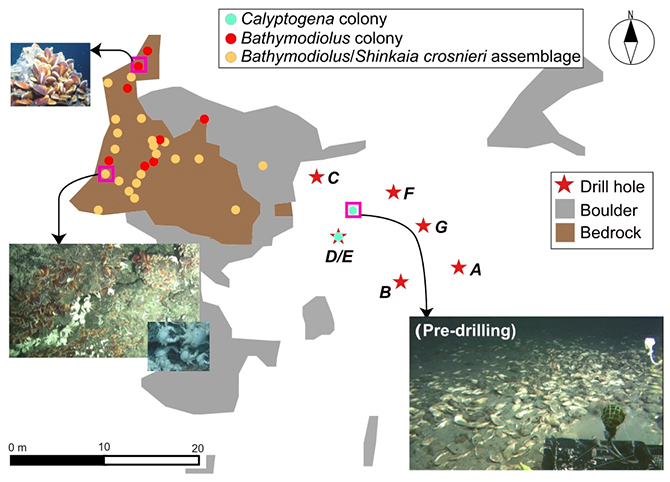 Based on quantitative observation and evaluation, this study revealed the mechanisms of formation of new deep-sea benthic communities around new artificial hydrothermal vents by migration and recruitment following changes in the seafloor environment, as a result of alterations in the flow of hydrothermal fluid following drilling operations. This study was carried out jointly by Department of Subsurface Geobiological Analysis and Research (D-SUGAR), the Research and Development Center for Submarine Resources, and the Center for Deep Earth Exploration (CDEV) at JAMSTEC, and was partly supported by the Environment Research and Technology Development Fund (S9 Project). The results from this study was published in PLOS ONE, an online scientific journal, on April 23rd (JST). 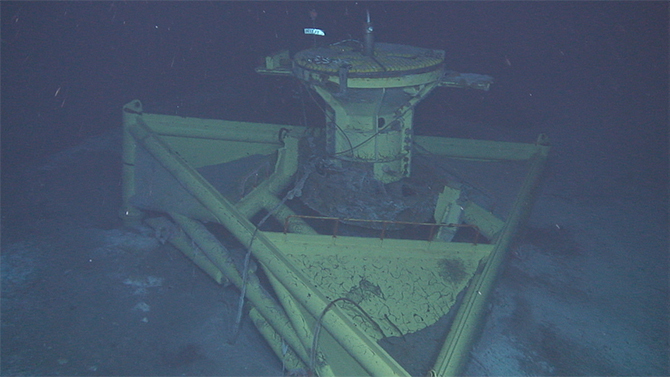 Figure 1: Iheya North field in Okinawa Trough. Shown here are North Big Chimney (NBC) mound, an activity center of the vent field and drilling sites during the IODP 331 Expedition. Figure 3: Habitat map around the drilling site C0014. 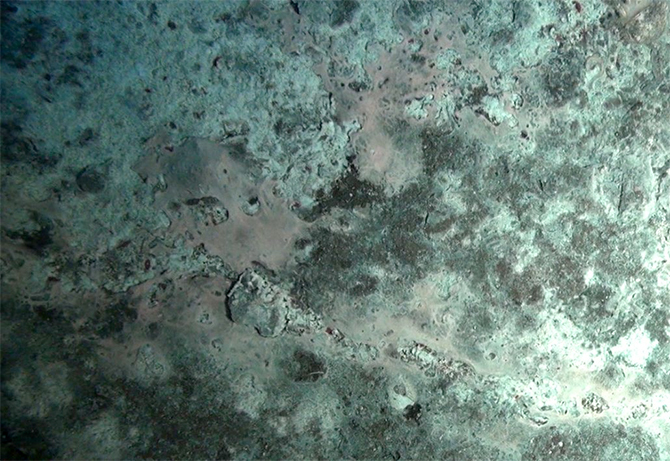 Before the drilling operation, the seafloor around the drill holes A-G were covered with soft sediments with distribition of Calyptogena colonies (mostly dead) as shown in the bottom right of photo. Moving more than 20km toward west from the drilling site, the seafloor bedrock increases, and benthos living near the hydrothermal vents such as Shinkaia crosnieri and Bathymodiolus mussels are inhibited there. Figure 5: The soft sedimentary seafloor was hardened with fissures after 38 months of the drilling operation. Kawagucci S, Miyazaki J, Nakajima R, Nozaki T, Takaya Y, Kato Y, Shibuya T, Konnno U, Nakaguchi Y, Hatada K, Hirayama H, Fujikura K, Furushima Y, Yamamoto H, Watsuji T, Ishibashi J, Takai K (2013). 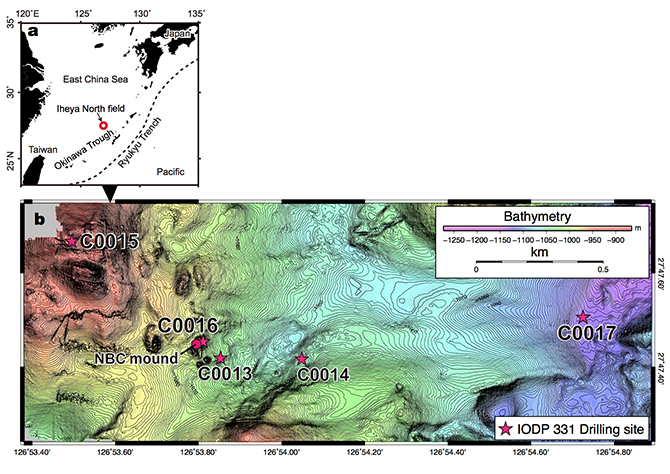 Post-drilling changes in fluid discharge pattern, mineral deposition, and fluid chemistry in the Iheya North hydrothermal field, Okinawa Trough. Geochemistry, Geophysics, Geosystems 14: 4779-4790. Nakajima R, Komuku T, Yamakita T, Lindsay D.L, Jintsu-Uchifune Y, Watanabe H, Tanaka K, Shirayama Y,Yamamoto H, Fujikura K (2014) A new method for estimating the area of the seafloor from oblique images taken by deep-sea submersible survey platforms. JAMSTEC Report of Research and Development, 19: 59-66. Takai K, Mottl MJ, Nielsen SH (2012). IODP Expedition 331: Strong and expansive subseafloor hydrothermal activities in the Okinawa Trough. Scientific Drilling 13: 19-27. Watsuji T, Yamamoto A, Motoki K, Ueda K, Hada E, Takaki Y, Kawagucci S, Takai K (2015). 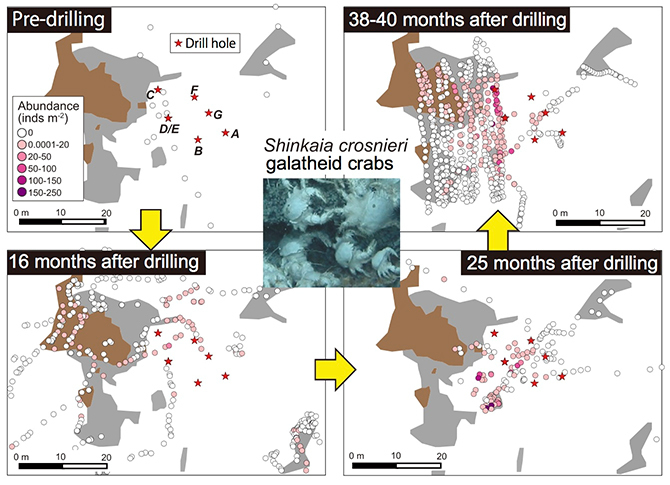 Molecular evidence of digestion and absorption of epibiotic bacterial community by deep-sea crab Shinkaia crosnieri. The ISME Journal 9: 821-831.